WASHINGTON — NASA has boosted its investment in two logistics services being developed for the international space station by $40 million so far this year, and plans to double that payout by the end of March despite the fact that Congress has yet to appropriate the necessary funds for the effort, according to an agency official. The additional payouts to Orbital Sciences Corp. and Space Exploration Technologies Corp. (SpaceX) cover newly created ground-test milestones for their respective cargo delivery systems, according to Alan Lindenmoyer, head of NASA's Commercial Crew and Cargo Program Office at the Johnson Space Center in Houston and NASA's Commercial Orbital Transportation Services (COTS) program manager. Lindenmoyer said his office has paid the companies an additional $40 million combined since the start of the fiscal year Oct. 1 and hopes to dole out another $40 million by the end of March. The two companies were set to split a $300 million COTS funding boost requested in the 2011 budget blueprint U.S. President Barack Obama sent lawmakers last February. But Congress has yet to adopt a spending plan for the year, instead passing a temporary appropriation Dec. 21 that leaves NASA to fund existing programs, including COTS, at last year's funding levels through March 4. NASA's 2010 budget included $39 million for the COTS program, under which Orbital and SpaceX are developing rockets and capsules that will ferry cargo to the space station on a commercial basis after the space shuttle retires. Both companies hold separate contracts to begin making those deliveries, which are expected to begin next year. Despite uncertainty about the 2011 budget, NASA is pressing ahead with the COTS funding augmentation. The values of the original SpaceX and Orbital COTS agreements are $278 million and $170 million, respectively. In a Jan. 5 interview, Lindenmoyer said the new COTS milestones and corresponding cash payouts were called for in the three-year authorization bill enacted in October that supported the administration's request to spend $300 million on COTS this year, despite concerns among some lawmakers that the 62 percent increase to the original $500 million COTS program budget was excessive. "The authorization act talked about adding additional funding to the COTS cargo agreements to reduce risk and increase the chances of success of these missions," Lindenmoyer said. "So along those lines we decided to implement at least the first quarter of those risk-reduction milestones on the two agreements [with] Orbital and SpaceX." SpaceX earned a $5 million cash payout from NASA Dec. 8 when it successfully completed the first of three planned demonstration flights of the Falcon 9 rocket and Dragon space capsule being developed with COTS funding assistance. The Hawthorne, Calif.-based startup hopes to combine the two remaining flight demos slated for later this year; Lindenmoyer said the agency is still reviewing that proposal. In the meantime, he said, SpaceX successfully completed four new milestones that the agency established in December and that were worth $5 million each. 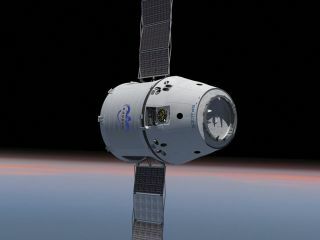 These included a plan to test the effect of vibrations on pressurized cargo stowed inside Dragon, followed by the successful demonstration of the test capability at the company's Hawthorne facility. A third milestone involved fully deploying Dragon's solar arrays and conducting thermal vacuum tests of some components. Finally, the company completed a ground simulation of the spacecraft's lidar sensor, used for rendezvous and proximity operations with the space station, at NASA's Marshall Space Flight Center in Huntsville, Ala.
SpaceX spokeswoman Kirstin Brost said the added tests would improve the likelihood of mission success. "These tests demonstrate the benefit of the payments-for-milestones system," she said in a Jan. 6 statement. "SpaceX only received payment after completing the tests." Dulles, Va.-based Orbital Sciences, which is developing its Taurus 2 rocket and Cygnus spacecraft under its COTS agreement, garnered a $20 million payout in December for completing a mission concept review in anticipation of congressional approval for an additional test flight of the medium-class rocket. Under Orbital's current COTS agreement, the company is slated to conduct a single demo flight of Taurus 2 and Cygnus later this year. Lindenmoyer said he is now negotiating additional milestones to be met by the companies by the end of March. NASA is aiming for an agreement that would require SpaceX to complete a more extensive test of Dragon's lidar sensor and to secure the ground facilities needed to conduct a full-scale thermal vacuum test of the capsule. SpaceX also would need to lease or otherwise acquire the infrastructure needed to test Dragon's resistance to electromagnetic interference, Lindenmoyer said. For Orbital, the added milestone payments would cover preparations for the additional test flight of the Taurus 2, which, if approved, would loft a simulated Cygnus capsule late this year. Orbital would be required to complete an analysis of the revamped inaugural Taurus 2 flight and a design review of the dummy capsule. "Since we still don't have a full appropriation we need to see what funding is available, if any, to get any of this done," Lindenmoyer said. NASA Chief Financial Officer Elizabeth Robinson said the agency has limited flexibility under the temporary spending measure, known as a continuing resolution, to shift money from other space exploration accounts to augment the COTS program by $300 million as proposed in the 2011 budget request. "Legally we can spend the [$300 million]; whether or not we can practically do it is another question," she said in a Jan. 4 interview.